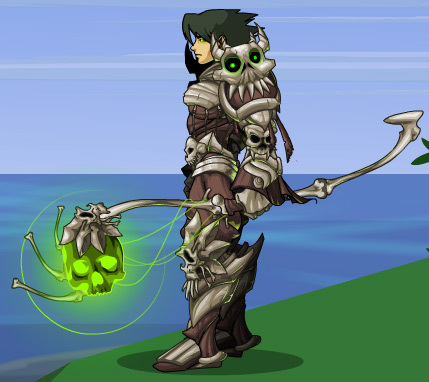 Location: Armor Closet, The Necropolis -> Artix -> Other Classes! -> Necromancer -> To Zorbak! -> Zorbak -> Become A Necromancer! 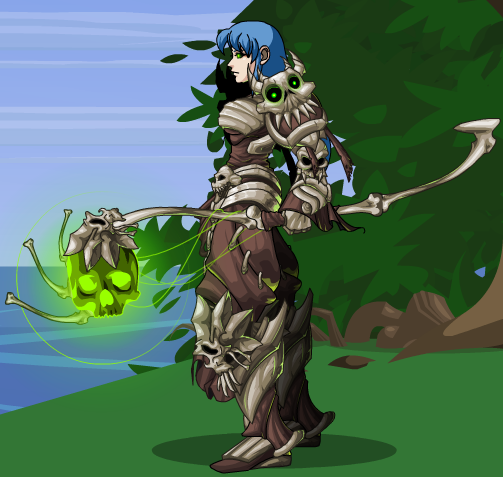 NOTE - Retro Necromancer uses new skills with the old armor's appearance/art. 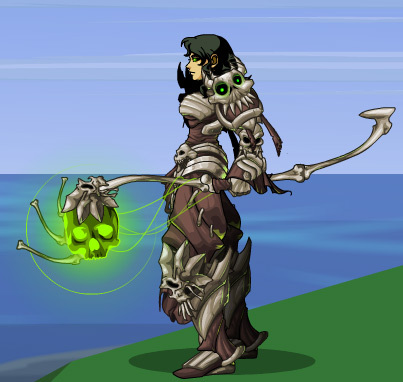 Location: Falconreach Libraseum -> 4 Right -> WEAR Retro Necromancer! Effect: Cast a Purple glowing aura around you. After 3 turns, if the skill/attack is an attacking one, you summon 1 extra Creature dealing a random amount of hits of 200-300% damage. 4. Attack - With seed bonus using an attacking move like crit, pet, summon, or normal you will get to summon an extra monster, if you still don't understand look below. 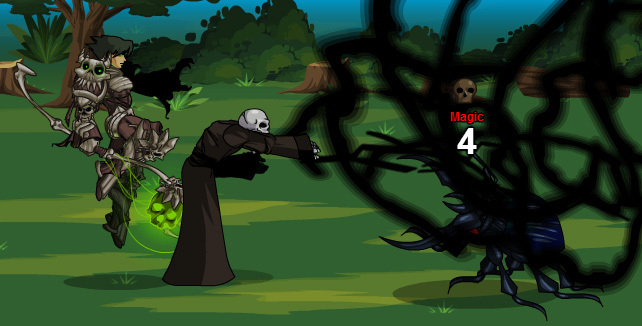 Normal Attack w/seed = Summon 1 of the undead monsters to attack then attacks normally (2-4 hits). Pet w/seed = Summons creature then pet (2-4 hits). Summon w/seed = Summons 2 random undead monsters to attack (2-6 hits). Crit w/seed = Hits with random monster then normal axe monster all crits (4-6 hits). The undead minion summoned through Seed takes its attack modifiers from the skill that will have it summoned on the third turn. Seed's 3 turns requirement carries over multiple fights. If the skill Dominate is used during the 3 turns requirement, it counts as 2 of the 3 turns. Summon effect will be cancelled by Corruption and/or Inspire Terror if either of them is used on the 3rd turn. Effect: Applies 'Life Tap', a 5% max player HP Melee Fear DoT, to target for 3 turns; heals player for 5% of their max HP for 3 turns. Effect: Restore 10% of your maximum mana. Effect: Calls a random undead minion; damage depends on the summoned minion; The damage applied does not include stat bonuses. 1 hit summons deal 130% damage. 2 hit summons deal 260% damage. 3 hit summons deal 390% damage. Effect: Runs up to the target and stabs it once, deals 120% damage and causes the enemy to sleep for 3 turns. Note: It does not inform you when the stun effect is resisted. Effect: Applies +180 Block/Parry/Dodge to player for 3 turns. +140% Resist to last attack's element. Effect: +140 Resist to the last attack's element for 3 turns. Effect: Deals 1 hit of 80% damage. Increases your Boost by 30 and your Bonus by 25 for 3 turns. Effect: Summon a minion that deals 3 hits of 60% damage, each hit has a 100% chance to crit. 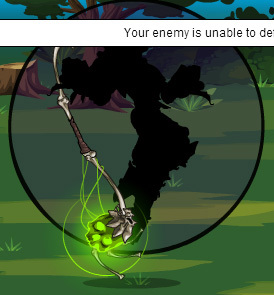 Effect: Summon a skeletal boot. Deals 1 hit of 160% damage to the target. Target attacks self or deals 160% Dmg. 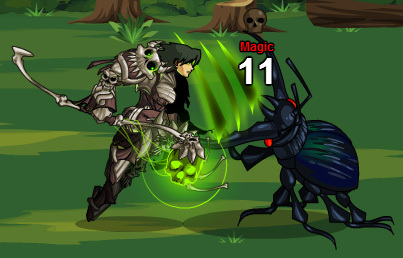 If dominated - Target enemy is stunned for 1 turn, and attacks itself (for its own dmg range and the "Fear" element). Note: Damage target does to itself is taken as a DoT effect on the target. Otherwise, target enemy gains +60% Boost for 1 turn. If used during Seed's 3 turn requirement, it counts as 2 of the 3 turns. Will Cancel Seed's Summon if used on the 3rd turn. Every attack causes a DoT effect on your opponent. It lasts 99 turns. DoT element is "Fear". It uses your equipped weapon to calculate damage. The status starts an invisible count at 1 and increases with each attack, except potions and trinkets, till it reaches a cap of 20 times. Rounded of course. So a 50-75 weapon after 10 turns would be doing 25-35. "Your enemy is unable to defend against your aura of fear!" "Your aura strengthens as your enemy trembles before you!" "Your aura is at its full strength as your enemy trembles before you!" Fully train this armor to unlock Necromancer badge. 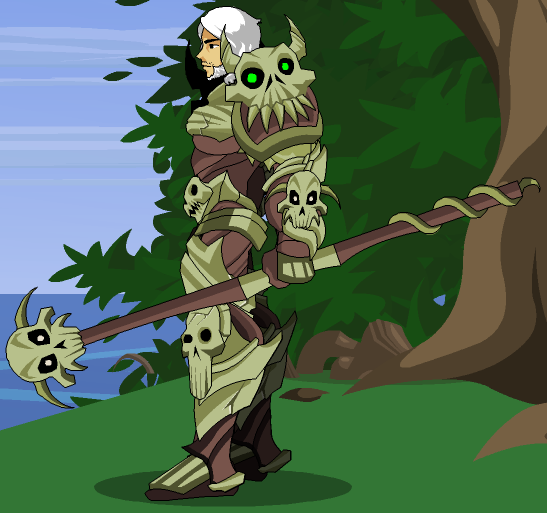 One of the summoned undead has its boots color-customed to your armor. Effect: Cast a Purple glowing aura around you. 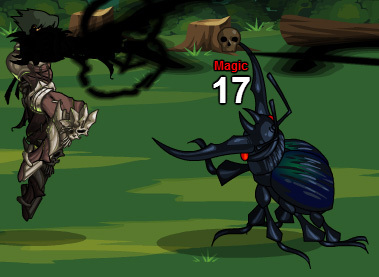 After 3 turns, if the skill/attack is an attacking one, you summon 1 extra Creature dealing a random amount of hits of 100-300% damage. Summon effect will be cancelled by Zombify and/or Dominate if either of them is used on the 3rd turn. Call an undead minion who targets MP. 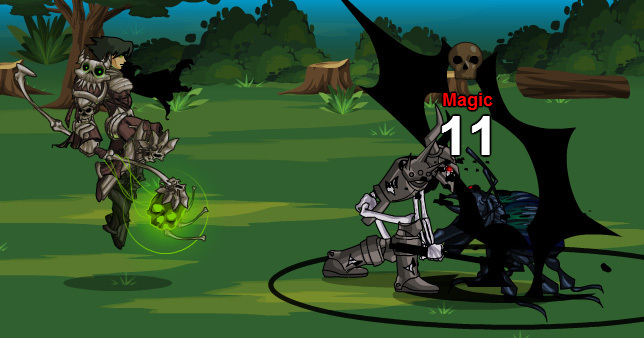 Effect: Summon an undead minion that attacks the target, deals random number of hits with 100% damage to the target's MP. Against 1 enemy: 100%-110% damage. Against 2 enemies: 75%-85% damage each. Against 3 enemies: 65%-75% damage each. Puts target to sleep for 3 rounds. Effect: Runs up to the target and stabs it once, deals 100% damage and causes the enemy to sleep for 3 turns. +80% Block for 2 turns. Effect: Cast a purple aura that shields you, +80 Block for 2 turns. +200% Resist to last attack's element. Target: +80% to Block. All: 150% dmg. Effect: Summon a skeletal dog, deals 1 hit of 75%-150% damage to the target. Target attacks self or deals 150% dmg to you. If dominated - Target enemy is stunned for 1 turn, and attacks itself (for its own dmg range and element, not affected by stat boosts). Otherwise, target enemy gains +50% Boost for 1 turn. Boost gained stacks with Mystify's Boost. 120% Disease dmg over 10 turns. -50 to hit, monster does +75% dmg. Note: Damage Boost gained does not affect Dominate's "Dominated Hold" effect. 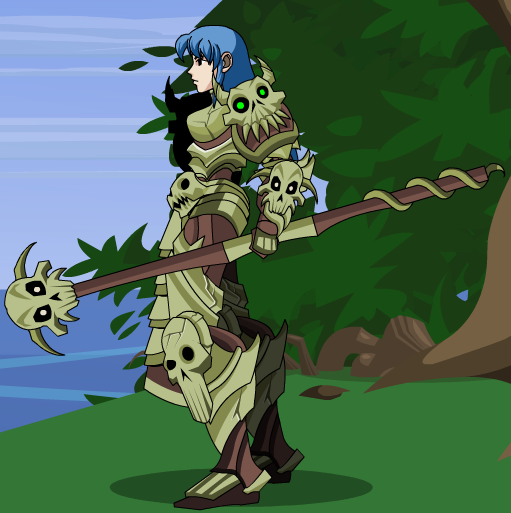 Therril Oreb for retired version's entry. pjc for skill images and icons. The ErosionSeeker for passive effect text. Sakurai the Cursed for corrections. Bryan on the DF Discord server for updated male image. Yoshino for updated female image. Gabriel Castro for additional note. Saojun for skill bar, original entry and links. 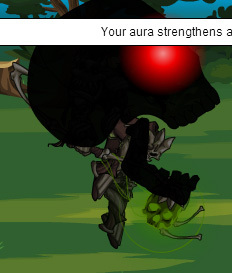 Jamenja for new skill bar. Therril Oreb for the previous entry.